"Heelys," the sneakers that turn into roller skates, are so popular that shoe stores can hardly keep up with the demand. But, reportsCBS News Correspondent Mika Brzezinski, they can be dangerous. Brzezinski says you might call it the "walk and roll" generation, in which millions of kids are head over heels for Heelys. Parents have bought more than 4 million of the $60-$100 items for children as young as 5, Brzezinski points out. A wheel pops into the heel, and the sneaker becomes a skate, ready to roll just about anywhere. Many malls and schools have banned Heelys, due to safety concerns. "If sales are booming," says pediatrician Dr. Steven Krug of Chicago Children's Memorial Hospital, "we will see more injuries in our emergency departments. The injury that we fear the most are head injuries." He observes that, because Heelys are often sold in shoe stores, many parents assume they're as safe as sneakers. But one wrong move on a slick tile surface, such as those in schools and malls, can result in injuries. Brzezinski spoke with Valerie Poston of San Diego, whose nine-year-old daughter, Katrina, suffered a concussion when she lost her balance wearing Heelys at a mall. "It just didn't dawn on me that they were so dangerous," Valerie told Brzezinski, adding she never thought twice about letting her girls wear Heelys. Katrina's sister says, "My sister took a few steps, and then her foot just slipped out from under her and she just fell back." "We both heard the big thump, terrible, terrible thump," says Valerie, "and we came running and found her on the floor crying, holding the back of her head." Now, it's no Heelys for the Poston girls unless they're wearing helmets. "They should put more of a warning out that the skates, they're not tennis shoes, and you shouldn't be shopping with them," asserts Valerie. 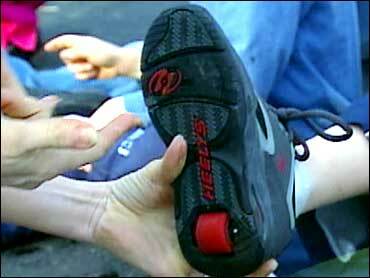 The manufacturer says it's doing its part, noting Heelys are athletic gear, just like roller blades or skateboards, even though they're sold in regular stores. Heelys executive Charlie Beery says, "We strongly encourage all the kids to wear protective gear whenever they can." A yellow warning label is glued to the bottoms of new Heelys but, Brzezinski notes, the company claims it can't be sued for injuries resulting from the use of Heelys if that sticker is removed. Beery adds that the company promotes safe behavior with "Team Heelys," a group of young experts who hold "heeling" seminars for kids at stores and parks nationwide. The company also has videos on its Web site of "heelers" in action. "Our intention," Beery says, "is to provide them with information about how to safely heel." But some of the video shows heelers "crashing and burning," tripping, falling, jumping off railings, flying into pools, with no protective padding, and no helmets. "That is part of the risk," Beery says. That bit of video is supposed to show kids what not to do, he continued. Brzezinski showed the video to a group of youngsters, and several didn't seem to get the message, instead saying they wanted to do what they saw the heelers doing on the video.